Diane Clancy creates vibrant paintings that feature color and vision to inspire and uplift people. Diane says, "I feel very blessed to have this opportunity to express myself through painting. I love that people say my artwork enhances their lives." Diane has created numerous works of art in a variety of mediums. 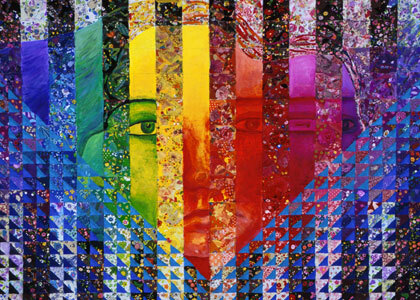 Her sense of color draws them all into a cohesive body of work. Abstract, modern and contemporary her work includes mixed-media, pastels, fractals, bubblescapes and mandalas. Diane makes her work available directly from her and also she has several online shops where you can buy clothes, home decor, kitchen items, cards and lots more! Diane Clancy's Art Shops (new window) brings together all of Diane's shop so you can see the variety and extent all at once! Very exciting to see so much merchanise from both Diane and her friends. Check it out!! Diane Clancy's iShop (new window) showcases a variety of home decor (shower curtains, window curtains, towels, table cloths, rugs and much more), fashion (shoes, dresses, caots, sweatshirts and lots more), household items, electronics, items for your office. All this in a great variety of styles. Diane has been creating matching duvet covers, curtains, rugs, and pillows at CafePress. New shop that showcases Home Decor (new window) organized so that you can see shower curtains, duvet covers, area rugs, window curtains, throw pillow, woven throw blankets and art for the wall. Easy to navigate! Here is a page on her blog (new window) that showcases several of her duvet covers if you want to see how they look. More pages with sandals and gift wrapping paper. Diane's paintings are available as magnets, postage, cards, mugs, skateboards, tiles, lamps (both hanging and table), gift wrapping paper and more at Diane's Fine Art Zazzle Shop (new window). Diane's fine art paintings are available as duvet covers, shower curtains, area rugs, window curtains, kitchen items, mugs, totes, tiles, buttons, pendants, journals and more at Diane's Fine Art CafePress Shop (new window). Online Art Gallery is getting rebuilt. This exhibition will showcase Bubblescapes, Fractals, Zentangke Inspired Art (ZIA), Patterns, Traditional Mediums and Fanciful Animals.